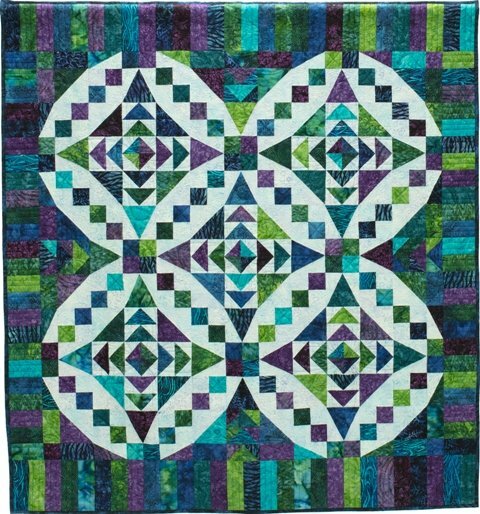 Little Jewels - 56" x 60"
The "Little Jewels" quilt was a mystery quilt made during our 2015-2016 Scrap Tamers Club. It gives the illusion of curved piecing but is made with all straight seams. It was a club favorite! You may recognize the pattern as a smaller version of our favorite "Faceted Jewels" pattern. Selecting your fabric: You will need 1/3 yard cuts of 16 prints and 1-5/8 yards of one background. You will want the prints to be fairly close in value and show up against the background. It would be a great quilt to make from your stash, as it can be a really scrappy quilt. We have included instructions for cutting from planned yardage and also total numbers of the different size pieces if cutting from your stash.